To set up additional account protection and receive alerts from Yandex services, you can link your mobile phone number to your Yandex account. Yandex.Passport allows you to link multiple phone numbers to your account, but only one of them can be used as a protected number for recovering access if your credentials are lost or stolen. The protected number can also be used instead of a username when logging in to Yandex. All phone numbers you've added to your account are listed on the Phone numbers page. Only one protected number can be linked to an account. This number can be changed, however, and you can have as many additional (unprotected) numbers as you want. Enter the phone number in international format and click the Add button. Yandex will send you an SMS with the confirmation code. Note. One number cannot be linked to more than 10 accounts at the same time. If the number you enter is already linked to 10 accounts, Yandex.Passport will automatically unlink it from all other accounts. An email notification will be sent to the inboxes of the un-linked accounts. Enter the confirmation code you receive in the Code field to confirm that the phone number being added belongs to you. To confirm that this is your account, enter your account password (not the payment password) in the Password field. If you enter the correct code and password, your phone number will be linked to the account immediately. It's easy to change an additional telephone number: just link the new additional number and delete the old one. Note. If you lose your SIM card or it stops working, you can restore your number at one of your mobile operator's locations. Click Edit next to your protected phone number. If you don't have access to your old phone number, flip the I have access to the phone number... switch to off (in this case you will have to wait a month for the phone number to change in the system). Enter your new phone number in the field and click Replace. Yandex will send a confirmation code to your new phone number and a message with the code to your old phone number (if you indicated that you have access to it). You can also receive notifications to all email addresses that are linked to your account. If you can still access your old phone number, then start by entering the confirmation code you receive at that number. If you can't access your old phone number, then enter the code that was sent to your new number. Enter your password and click Confirm. If you entered both codes correctly, your phone number will be changed when you click the button. If you do not have access to the old number, you will have to wait a month for the linked number to change. You can cancel the pending phone number change at any moment just by clicking Cancel on the Phone Numbers page. You can also delete a phone number that you don't own anymore or that you don't want to use for messages from Yandex. Click Delete next to the phone number. An additional number can be deleted immediately, but deleting your main number requires that you confirm using an SMS code. 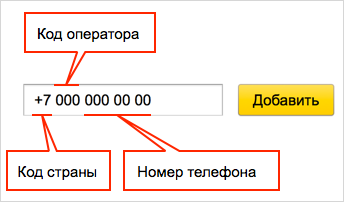 Yandex will send two messages to the protected phone number that you want to delete: a deletion notification and a numeric code. You will also receive notifications at all the email addresses linked to your account. If you don't have access to the phone number, flip the I have access to the phone number ... switch to off (in this case you will have to wait a month for the phone number to be deleted). Enter the code you received (if the phone number you want to delete is accessible) and your account password. Then click Confirm. If you correctly enter the code you received, the telephone number will be deleted when you click the button. If you don't have access to the number you want to delete, it will be deleted in 30 days. This delay protects you if a hacker breaks in to your account and tries to delete your phone number. You can cancel a scheduled deletion at any moment: just click Cancel on the Phone Numbers page. If you don't click Confirm, the system will automatically un-schedule the number for deletion in a month (so it won't be deleted).